Deck-building games allow players to utilize supply decks to craft their own personal decks throughout a game. Each game will inevitably result in a brand new deck for each player. Deck-building games are a relatively new genre and although there may have been games with similar mechanics, Dominion is generally thought of as being the first true deck-building game. Players all begin the game with the same cards and by the end, will have a completely unique deck. The mechanic is a simple one, yet has countless possibilities for variations on the theme. Perhaps this is why the market is bursting with new deck-building games, both pure and non-traditional. They all have their own take on this flexible genre and have creatively spawned a variety of options for every player out there. Today we’re looking at some of the best and highest-rated deck-builders on the market to see what they’re all about. A deck-building game where players spend Runes to acquire powerful cards for their deck. It offers a dynamic play experience where players have to react and adjust their strategy accordingly. Star Realms is a spaceship combat deck building game where you play powerful ships, destroy enemy bases or blast your opponent directly on your way to victory! Explore the dungeon, fight monsters, collect treasure, complete side quests, join guilds, and more in this massive and engaging fantasy experience. It’s your chance to take on the role of one of the greatest heroes of the DC universe. Race your opponents to see who can build the world’s greatest deck one card at a time. Vikings gone wild is a deck-building, resource management game based on the online real-time strategy game. The forces of evil are threatening to overrun Hogwarts castle in this cooperative deck-building game, and it’s up to four students to save the school! Dominion was the first game of its kind and the original deck-building game. There’s something to be said about being first. That’s why I still call “shotgun!” when running to the car. Dominion is one of my favorite deck-building games. If you have never played a deck-building game and want to get a feel for one, that doesn’t require collecting cards and is easy to learn, I highly recommend you start with Dominion. We review Dominion in depth here, and all of the expansions here. Ascension was designed by three (yes, three) of the Magic: The Gathering world champions. They wanted to create a game that was less intense and easier to get into than Magic, while still having some of the same elements. Ascension: Deck-Building Game — originally released as Ascension: Chronicle of the Godslayer was designed by Magic: The Gathering Pro Tour champions Justin Gary, Rob Dougherty, and Brian Kibler, with artwork by Eric Sabee. Available as a PC game on Steam. Ascension is a fantasy-style deck-building game, where you are building up your forces (deck) to slay monsters to gain fame. It’s pretty straightforward lore and strategy. This is a good thing when it comes to gameplay. The mechanics are all very streamlined, and it’s pretty easy to set up, learn, and get started. Unlike other deck-building games there are only three regular cards that are always available for purchase, and then there is a common pool of six cards. As cards are purchased, new cards are drawn from the deck and replace them. Having a randomized buying pool can really alter strategies in a deck-building game. With the first expansion, everything seems very fluid and it’s hard to pin down an actual strategy. However, with the first few expansions, it feels much more fleshed out and complete. This is an excellent starter game for players who are completely new to deck building. It’s an easy setup with easy to follow rules, but does has some strategy to it. If you’re experienced with deck-builders and just looking for something different, Ascension might be what you’re looking for, but if you’re looking for something a bit heavier you might want to check out some of the others on this list. There is a digital version on Steam and on mobile apps if you want to give it a test ride before committing your shelf space. Star Realms is one of the easiest deck-building games to pick up and play, and it’s incredibly fun. It’s a streamlined mashup of deck-building and CCG (collectible card game) dueling. I actually first tried Star Realms through their free electronic version of the game on Steam. Yep, you heard me. Free. Of course, the publishers lock multiplayer options and expansions, but for a free taste of what the game is like, you can’t beat it. Star Realms is a spaceship combat deck-building game by Magic: The Gathering Hall of Famers Darwin Kastle and Rob Dougherty. There’s quite a lot of strategy to be had in such a small package. The whole deck is tiny compared to what you would see in other deck-building games. Players draft cards from a shared lineup and buy cards that increase their purchasing power or attack power. With attack power, you can attack your opponents’ life points directly, and last player standing wins. Players can also buy space station cards that give bonuses and act as a buffer for your life points. Players will have to destroy any space stations you control if they want to attack your life points. There are several factions in Star Realms that have their own individual strengths. Trade Federation: The Trade Federation are all about subjugating the Gungan race on Naboo. The Trade Federation generates massive income and has cards that increase your life points. Blobs: Think swarm. Blob cards will increase your attack and allow you to discard cards in the buy row. Empire: The Empire will give you access to a lot of combat power very quickly. Their cards also tend to force other players to discard cards. Taxes, amirite? Machine Cult: The machine cult cards are full of bases and allow you to trash cards in your deck. Each faction plays to its strength, but you’re never limited to one faction. You can buy cards from any faction that’s on the buy row. However, some of the cards will give combo bonuses if you play multiple cards from the same faction, giving you the incentive to specialize in only one or two factions. 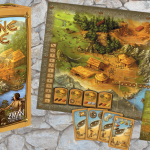 The base game can easily fit into a small card box and is perfect to travel with, and the game is perfectly fine to play with just two players. Kendra and I have played a ton of games while wandering around new cities. 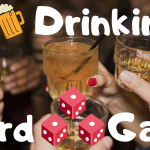 One of our favorite things to do is people watch and play games at a local pub or cafe and Star Realms is very easy to travel with. I’m a huge sci-fi fan and it’s nice to see this theme done so well in this game. It’s a nice change of pace from all of the fantasy-themed games out there. Star Realms is an excellent example of what a deck builder can be. It’s compact, easy to play, easy to learn, gorgeous artwork, and jam-packed full of strategy. Thunderstone Quest (not to be confused with Thunderstone) is a dungeon crawler deck-building game. If you’ve only played the original Thunderstone, whether you loved it or hated it, I highly suggest you take a look at Thunderstone Quest. There are several things that make Thunderstone Quest stand apart from other deck-builders. For one there are several locations that characters can go to and perform actions on their turn. If players go into town they can purchase cards, heal, and gain several different resources, or players can go to the dungeon and try and slay monsters for victory points. The most defining difference between Thunderstone Quest and all the other deck builders is the huge amount of thematic elements that come with gameplay. In town, players can purchase several types of cards. Players can upgrade heroes to make them stronger, or item cards that will give bonuses in combat, and even weapons that can be equipped by heroes while crawling through the dungeon. To actually delve into the dungeon, players are going to need light. It is a dungeon after all and dungeons are dark. Some cards will give light points, but torches can also be picked up in town. Each section of dungeon now has a board that will sometimes grant different bonuses for defeating the monsters in that room, and the farther into the dungeon you go, the better the bonuses and the more light points you need to actually get there. As monsters are defeated new monsters are drawn from a deck to replace them, and hidden in the monster decks are several keys. Once 4 keys are drawn the game ends and players will have a chance to take down the BBEG (Big Bad Evil Guy) for some serious bonus points. I did not like Thunderstone (the original game). Some people preferred it over Dominion, but it seemed like someone just slapped on a fantasy theme on Dominion and called it a day. Thunderstone Quest is an entirely different beast. Everything about the game has evolved and is an entirely different game from Dominion now. The town mechanics and dungeons have all been upgraded and it looks great. Instead of having a stack of cards and pretending its a dungeon and town, Quest now has boards for each that look fantastic and function incredibly well. Speaking of the boards, Thunderstone Quest’s production value has been amped up to 11. The box is huge (room for expansions) and it comes with a very clean card tray to easily organize and store everything. I didn’t like Thunderstone. I love Thunderstone Quest. Give it a try and see what you think, but if you like deck-builders I think you’ll be pleasantly surprised. Legendary is probably one of the most recognizable deck-building games right after Dominion. One of the best things it has going for it is that it’s produced and licensed by Upper Deck, the trading card company. It’s a logical choice for a company that has basically been producing trading cards since I was born (we both came into existence in 1988). I know the inner hipster in all of us is whispering in our ears, “Why would you buy from a big corporation when there are so many awesome indie games out there?” Might as well go play Monopoly. Well, the answer is a simple one. The big corporation became a big corporation because it was doing something right, and Legendary is a fantastic example of a deck-building game. They’ve built a unique version that’s also cooperative. All players will work together to draft cards into their deck to beat the board. This brings us to the next reason why having Upper Deck produce a deck-building makes sense. They have the resources to put out an extremely refined product and have the capital to license your favorite versions. The playing mats that come with the game are gorgeous and add to the experience of the game while keeping all of the cards in order. Upper Deck also has secured licenses to produce a ton of different themes and versions for their Legendary system. Legendary changes deck-building mechanics in several ways. The most noticeable is that it is a truly cooperative game. All players are working against the board to defeat whatever fandom’s villain you’ve decided to challenge. I personally chose the ALIENS version. Players will have a common pool of cards that they can buy from. As they purchase cards, they are replaced from a shuffled deck of all available cards. There is no separate stack. Everything is shuffled together, so if you really like a particular type of card, then you’re going to have to hope you get lucky. As you progress in the game, enemy cards are flipped and slowly move down a track. If they get down to the bottom, then bad things are going to start to happen. 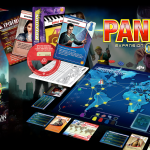 The game is frantically-paced with players trying to secure cards for their deck, stopping enemies from reaching the end of the track, and preparing for the final boss fight at the end of the game. It can be rather difficult, and my first two times playing the ALIENS version, my character died from an alien bursting out of my chest. Great fun for the whole family. Legendary definitely caters to its fandom, but that’s not really a bad thing! I love cooperative games and really enjoyed Legendary. The game is difficult and there are a lot of moving parts, but it still managed to keep my attention. One of the glaring flaws that I’ve seen with this game is the box. For a game that is primarily cards, they didn’t really plan on putting any dividers or organizers. There are just a few rows of card inserts and some random foam squares that don’t fit. It’s absolutely hellish to get set up and find all of the cards. The game itself is fantastic, but setting it up shouldn’t take longer than the game. Cryptozoic is one of the companies that I absolutely adore. They make one of my favorite card games (Epic Spell Wars) and they are also the creators of the Cerberus Engine Deck-Building System. If you are familiar with deck-builders or new to the concept, Cerberus Engine will be relatively simple for you to pick up and play. Cerberus Engine Games is the catch-all name for Cryptozoic Entertainment’s series of deck-building games and expansions that started in 2012 with DC Comics and has gone on to license many more! Each player selects (or is randomly dealt) a hero character that will give them a particular starting hand or give them a special ability that they can use throughout the game. The card lineup is where all players can purchase cards that give them abilities: Attacks, Purchasing Power, Defense, or any other of the usual cards you’d find in a deck-builder. Players then gain victory points by picking up certain cards or by defeating enemies from the separate enemy card pile. The game ends when the main draw pile is empty or when the enemy draw pile is empty. Now if you’ve read this far you know how incredibly vague I’ve been about the games themselves, and there’s a reason for that. Because Cryptozoic built a game engine that can work with many different systems all they have to do is change the cards and adapt them to a new theme, and boy, do they cater to their audience. Where Marvel went with the Legendary system for their deck-building game, DC Comics went with the Cerberus Engine. Basically, anything and everything in the DC universe can be found in the Cryptozoic deck-building games. The great part about their system is that it’s easily adapted to other fandoms and you can easily play some of your favorite characters in a tabletop game that you otherwise wouldn’t see. • Each Super Hero has a unique special ability that will open up different strategies. With increased popularity in board games, we get the added benefit of increased innovation. Although Clank! can be classified as a deck-building game, it really is much more than that. In Clank! players take on the role of an adventurer who delves into a dragon’s lair in search of treasure. Players must press their luck to get deeper into the lair to loot the prized treasure deep within. But, if they aren’t careful or make too much noise, there’s a good chance that they’ll awaken the dragon and become just another skull lining the cave. Clank! is a dragon’s lair-looting game that is one part deck-building and one part adventure game. Each player drafts their own deck using standard deck-building mechanics. The cards in their deck are going to determine what the player can actually do in the dungeon. As a player, all of your actions come from your deck, so you need to carefully plan what goes in. There’s no point being the strongest adventurer on the board if you can only move one space every other turn. Believe me, there’s nothing quite as infuriating as getting within steps of the exit and being devoured by the dragon. Clank! is so much more than a simple deck-building game. It’s a fresh approach to the genre and brings an extreme level of tension to the game. You’re much more invested in your little meeple running away from the scary dragon meeple (Dreeple??). As in all things, there will be people who disagree with me and purists who claim that it diverts too much from traditional deck builder, but I thought it was a breath of fresh air and a lot of fun. 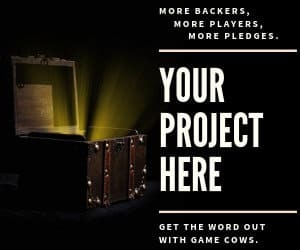 Here at Game Cows, we go on and on about how Kickstarter games breathe new life into the board game industry. Well, here is an excellent example of one such crowdfunded game. In Vikings Gone Wild, players get to join an enormous brawl with all of the other players. Your resource cards are Gold, Fight, and Beer. What could be better? Vikings Gone Wild is a deck-building and resource management game based on the online real-time strategy game. If we know anything about Vikings we know that they liked to raid and pillage. The cute little town hall that you’ve spent all that time upgrading could at any time be attacked by other players. There goes your perfectly arranged drinking horn collection. To help defend (or attack) you can draft special hero cards based off of Norse mythology, like Odin, Freya, or Thor. Vikings Gone Wild does a lot of things right. The simplistic premise of Vikings drinking and fighting, combined with easy-to-learn rules may seem a little too one-dimensional, but the game has a surprising amount of strategy too. The game doesn’t take itself too seriously. All of the cards are extremely well done and the artwork is gorgeous. It is such a well-polished game, that it definitely deserves a spot on your gaming shelf. Fun Fact: Norse gods still make an appearance in our everyday lives. Tuesday – Old English “Tiwesdæg” or Tiw’s Day, from Týr the Norse god of war. Wednesday – Woden’s Day, from Woden/Odin, King of the Norse gods, god of poetry, battle, and death. Thursday – Thor’s Day, Norse god of thunder, sky, and fertility. Friday – Freyja’s Day, Queen of the Valkyries, Norse warrior goddess of wisdom and magic. Harry Potter fans are going to absolutely love this game, but it will by no means appeal to diehard fans alone. The Harry Potter deck-building game isn’t just a generic reskin to make a quick buck; it has truly made some unique innovations that I think really make the game shine. The first thing you’ll notice when you open the box is that there are seven labeled boxes inside, Year 1 – Year 7. My first reaction was, “Oh yeah!, This is going to be awesome.” Let’s be honest, if you’re a Harry Potter fan, you’ve at some point fantasized about getting an owl and going to Hogwarts to learn magic. We all do it. No judgment here. Harry Potter: Hogwarts Battle is a cooperative deck-building game, where Hogwarts students face off against villains to protect the castle from the forces of evil. With the Harry Potter deck-building game, you start at Year 1 and you don’t progress to Year 2 until you defeat the villains of the current year. Each player takes the role of one of the iconic students of Hogwarts and works together to defeat the villains. The villains include random death eaters, castle-dwelling monsters, or the evilest villain of all time, Professor Umbridge. Voldemort is in the game too. The game plays like most deck-builders in that you will draft your decks and use your influence to purchase cards and abilities. All of the cards are heavily tied to the books and movies, so my fellow book nerds will be able to pick up references that only show up in print. The most interesting thing is that the game evolves with each successive play. In the beginning, characters may not have any abilities or special powers, but by Year 7 just like our favorite characters, they’ve all matured and it shows through their own character abilities. The game gets exponentially harder the further you go. Every boss reappears in every game, so by the time you hit Year 7, you have to defeat every single boss before getting to Voldemort. It can be a little challenging, but who said being a wizard was going to be easy? Harry Potter: Hogwarts Battle is a fantastic deck-building game. Using lore from books and movies, they created a fun game with excellent cards. The year system is especially cool. It gives it the feel of a legacy game without having to destroy your game. This game will definitely please both Harry Potter fans and board game fans alike. 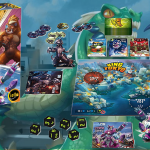 Since Dominion’s inception, there have been numerous clones and innovations in which designers have used the idea of building a deck for a single game to make their own board game creations. There are now hundreds of games out there that use this mechanic. This list is by no means exhaustive. We wanted to highlight some of the most well-known to get you started. If your favorite didn’t make the list, we’d love to hear from you. Leave a comment below if we missed anything.